With a regular pump therapy, extended boluses are a good way to deal with fatty or otherwise slowly-absorbed meals which increase blood glucose longer than the insulin is in effect. 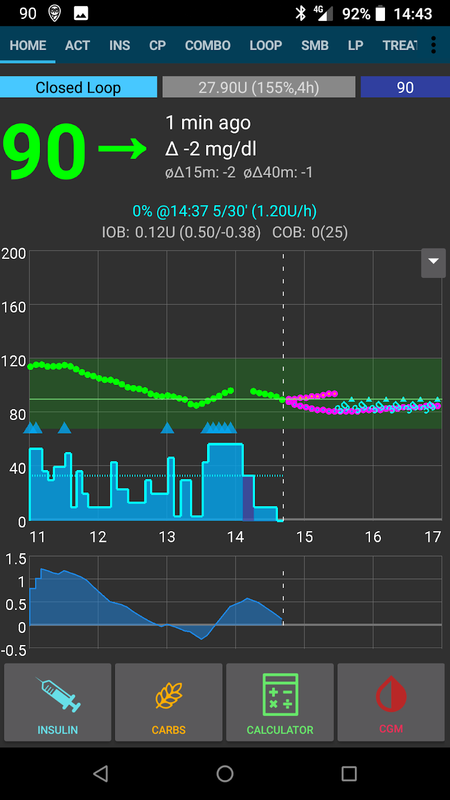 In a loop context, however, extended boluses don’t make as much sense (and pose technical difficulties), since they’re basically a fixed high temporary basal rate, which goes against how the loop works, which is adjusting the basal rate dynamically. The need to deal with such meals still exists though. 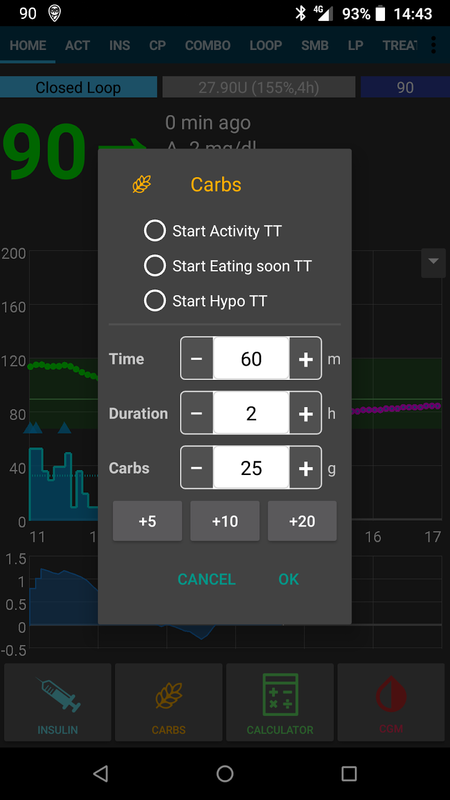 Which is why AndroidAPS as of version 2.0 supports so called extended carbs or eCarbs. eCarbs are carbs that are spilt up over several hours. For standard meals with more carbohydrates than fat/protein, entering the carbs up front (and reducing the initial bolus if needed) is usually sufficient to prevent too-early insulin delivery. 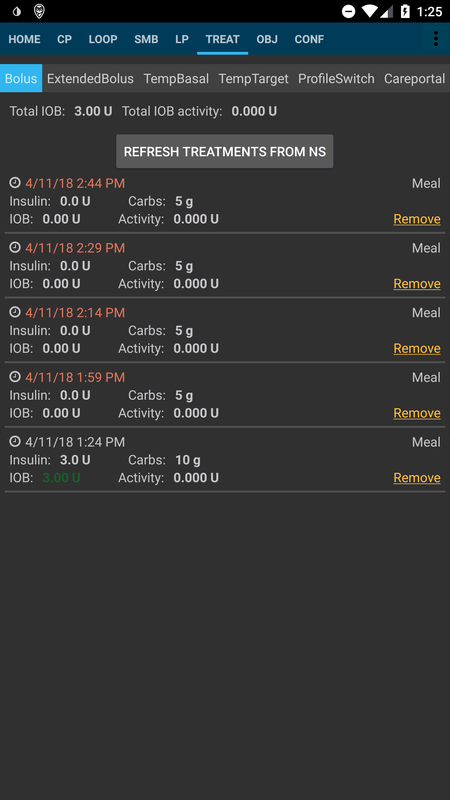 But for slower-absorbing meals where full carb entry up front results in too much IOB from SMB, eCarbs can be used to more accurately simulate how the carbs (and any carb equivalents you enter for other macronutrients) are absorbed and influence the blood glucose. With this information, the loop can administer SMBs more gradually to deal with those carbs, which can be seen as a dynamic extended bolus (this should also work without SMBs, but is probably less effective). eCarbs aren’t limited to fatty / protein heavy meals: they can be also be used to help in any situation where there are influences that increase the blood sugar, e.g. other medication like corticosteroids. The recommended setup is to use the OpenAPS SMB APS plugin, with SMBs enabled as well as the Enable SMB with COB preference being enabled. A scenario e.g. for a Pizza might be to give a (partial) bolus up front via the calculator and then use the carbs button to enter the remaining carbs for a duration of 4-6 hours, starting after 1 or 2 hours. You’ll need to try out and see which concrete values work for you of course. You might also carefully adjust the setting max minutes of basal to limit SMB to to make the algorithm more or less aggressive. With low carb, high fat/protein meals it may be enough to only use eCarbs without manual boluses (see the blog post above). 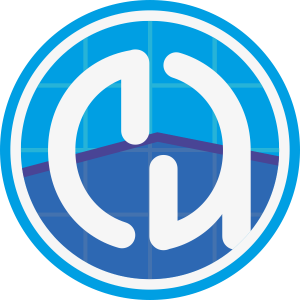 When eCarbs are generated, a Careportal note is also created to document all inputs, to make it easier to iterate and improve inputs.